Thanks Everybody Who Helped Tak With The Gift's I Got Everything Today loved Everything and I Really Appreciate it and The Custom's Are My Favorite's out of Everything they Looked Amazing and Very well Done I Wish I Was That Good at Customizing MLP's I Haven't Been Able To Make anymore Custom's But Want To, But I Can't Rehair . And I Have No Names or Idea's For Any Right Now. She is My Favorite and I Really Love The Manson One To. Pony people take care of each other. Glad you liked everything! 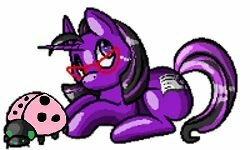 Tak and I had fun making your Manson pony, I hope him and pretty little nightmare bring you lots of good pony vibes!